This past Wednesday, a small group of sisters and I gathered at a friend’s home for iftar, the evening meal at the end of a day of fasting. 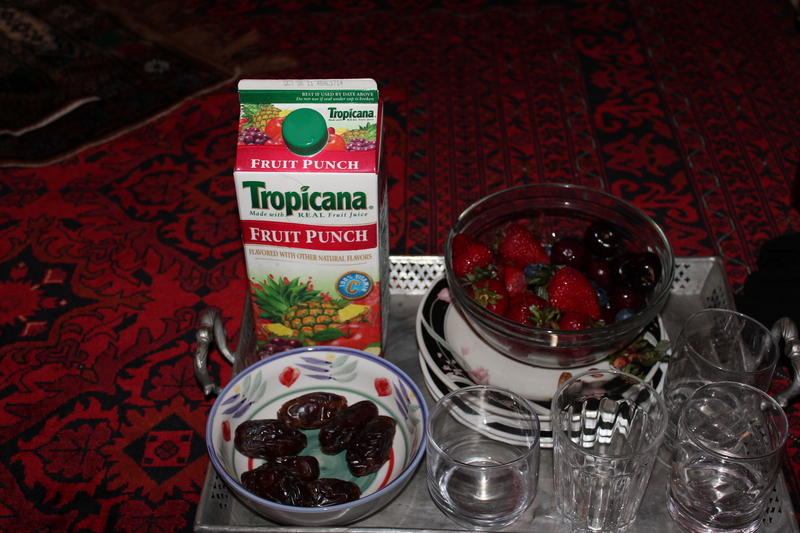 We had dates and assorted fruit with water and juice. Quiet moments of reflection, prayer, and contemplation were intertwined with lively conversation. The conversation flowed easily and we spoke about work, current events, exercise, fencing, the beauty of having an Islamic perspective, and long-kept momentos from our youth. We prayed and then went out to eat at a local Afghan restaurant. Our server, a young woman of Afghan descent mentioned she felt faint as she took our orders because she had yet to open her fast for the day. She said they had been very busy that night. We offered her a chair and our own water but she declined and said she would break her fast after putting in our orders. I’m always stunned by reminders of how much effort we put into working in this life and how much we neglect to put in the same effort or more towards working for the hereafter. Our host for the night, surreptitiously got up towards the end of our meal to use the restroom or so I thought. When it was time to go, we asked for the bill but to our surprise it had already been paid. When you’re eating out with Muslims and someone drifts away from the group, it’s probably because they’re about to pay the bill and don’t want you to find out. I love the friendly competition to pick up the tab for meals amongst my Muslim friends. It’s been elevated to a kind of art form, the ability to steal away and pay the bill before anyone notices. We ended the night praying tarawih led by Sh. Adam at the Westin Hotel in Tysons Corner. As we walked into the hotel, we didn’t know where to go and looked for someone to ask. One of the hotel staffers assumed we were looking for the prayer and directed us by pointing and saying “over there” without us having to ask the question. I don’t know Sh. Adam but I hear he’s Somali and the dominant ethnic group at the hotel is also Somali. As you approach the meeting rooms being used for prayer, you’ll pass by a row of young Somali brothers lined up on the wall hanging out. A little further down, you pass by a group of young Somali sisters, also in the hallway, seemingly having a blast chillin’ with their friends. The space designated for sisters has no visuals to the imam at all, you pray facing a desolate corner of the wall. If you are unlucky enough to pray towards the back of the room, accompanying the recitation of Quran you get the conversation and laughter from the girls outside. Their voices amplified by the open door, which also reduces the efficiency of the air conditioning in the room. Move towards the front if you can, it’s cooler and quieter and more conducive towards focusing in your prayer. One of the benefits of praying surrounded by so many Somalis is that you are easily reminded of the people suffering through the drought and famine in East Africa and to be thankful for the many blessings in your life. Where do you like praying tarawih the most? Eileen! Always happy to see you even if only online. So far this year I’ve enjoyed Dar us Salaam’s setup because we’re praying in a gym at the University of Maryland (pics to follow soon, insha’Allah) without a barrier and also at the ADAMS Center. Went to MCC, but the cool thing about that was the novelty of getting to pray outside.